TabSite offers a Editable Form Builder Widget for Fan Page Tabs. Now you can build a custom form to use on your fan page! The Editable Form Builder Widget is a Game-changer, enabling TabSite users to build forms for specific needs and uses, giving you the freedom you need to customize fields and field names, and to edit at any time. When the Editable Form Widget is dragged to the tab work area, the setup box opens to enable users to easily create and/or edit their form. 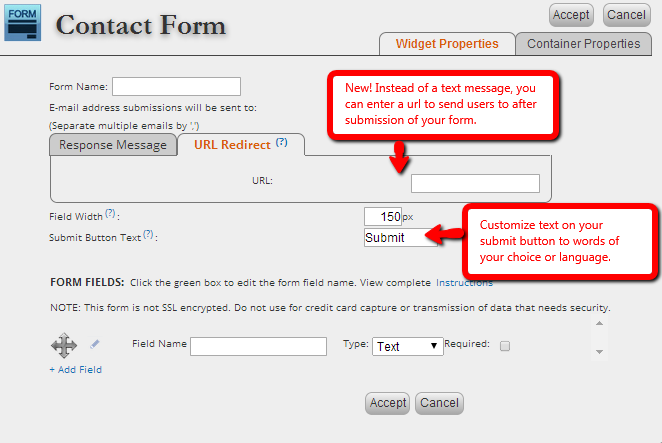 Simply add an e-mail address that forms are supposed to go to upon submission, then enter a message for users to see after submission of the form, or enter a URL for the user to be redirected to after submission (via URL Redirect tab shown below). Click the box (shown above) to edit the Field Name for each field in the Form Builder. 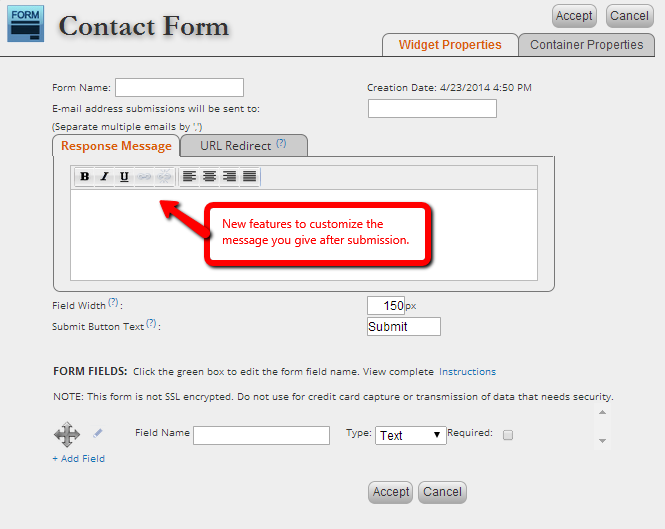 Use the arrows to move the fields up or down in order and click the "+Add Field" link to add a new field to your form. You can also customize the text on your "submit" button to another word or another language. You control what your submit button says! From here you can change the default font color, link color, heading color, and background color. Please be sure to uncheck the Transparent box if you choose to use a background color. After your inputs have been made, clicking "Accept" creates the form on your tab. The final result is a powerfully, flexible form with a wide variety of uses on your TabSite fan page tabs, giving you the capability to build lead capture and contest entry forms to boost engagement and interaction on your fan page.